“Now that Gov. Chris Christie, the Senate and the Assembly have joined together on a bipartisan compromise to reauthorize the Transportation Trust Fund, New Jersey’s infrastructure will have a much-needed influx of long-term funding. Regardless of how New Jerseyans feel about the deal, now that it exists it is imperative that the new funds do not get raided by Trenton for other expenditures. It’s up to the voters to safeguard this revenue and protect the future of our state’s infrastructure for years to come. 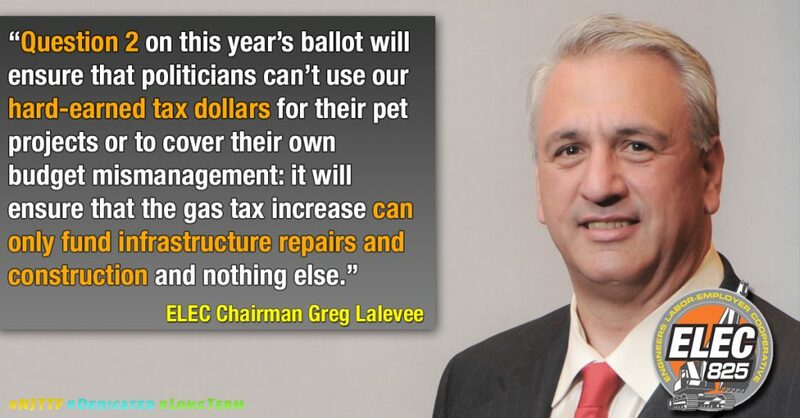 That’s why it’s critical for New Jerseyans to vote “Yes” on Public Question 2 to constitutionally dedicate all gas-tax revenue to the Transportation Trust Fund. Question 2 on this year’s ballot will ensure that politicians can’t use our hard-earned tax dollars for their pet projects or to cover their own budget mismanagement: it will ensure that the gas tax increase can only fund infrastructure repairs and construction and nothing else. Our infrastructure is crumbling and deteriorating right before our eyes. Our roads, bridges and rails cost New Jersey drivers hundreds of dollars in unforeseen repairs every year, hurt productivity, damage our business climate and endanger the safety of our residents. The Legislature and the governor have taken the much-needed step of passing bipartisan legislation that will raise the gas tax to fund infrastructure repairs, in exchange for a comprehensive package of tax reforms. Thanks to this deal, New Jersey can begin to put the worst of our infrastructure crisis behind us. Question 2 is not, however, a referendum on the gas tax — that legislation has passed. So we need to make sure our elected officials use the money it generates to better our state and improve our roads. Unless New Jersey votes “Yes” on Question 2, we risk getting right back into this mess and letting politicians waste our hard-earned tax dollars. We know what got us into this crisis. Years of legislative mismanagement, irresponsible borrowing and siphoning funds from the TTF to fill other budget gaps have left our roads in woeful shape. The fund now owes $30 billion in debt service. Transportation experts, New Jersey’s business community and residents — sick of dealing with delays, potholes and dangerous roads — have come together in support of dedicated funding for the TTF. This amendment is absolutely necessary to protect the future of our state and safeguard the investments we’ve already made in our infrastructure. Dedicating gas-tax revenue will help us build the 21st-century infrastructure improvements our state deserves. Without this source of funding, we risk falling further behind. As Christie’s emergency shutdown of all road projects across the state showed, any failure to fund the TTF has real, tangible consequences. During the shutdown, thousands of construction workers lost their jobs, road projects sat idled and saddled towns with costs for necessary maintenance, and the unforeseen delays have spawned cost overruns, legal fees and productivity costs. We simply can’t afford to risk another catastrophic infrastructure crisis. Greg Lalevee is chairman of the Engineers Labor-Employer Cooperative and vice chairman of the Transportation Trust Fund Authority. NJ.com/Towns with the worst commutes in N.J.